Make Learning Essential Math Skills Fun with NewPath's Learning Centers!. Help your students learn and recognize concepts of positions and opposites to include up & down; big & little; few & many; long & short; in & out; over & under; full & empty; wet & dry; and hot & cold. 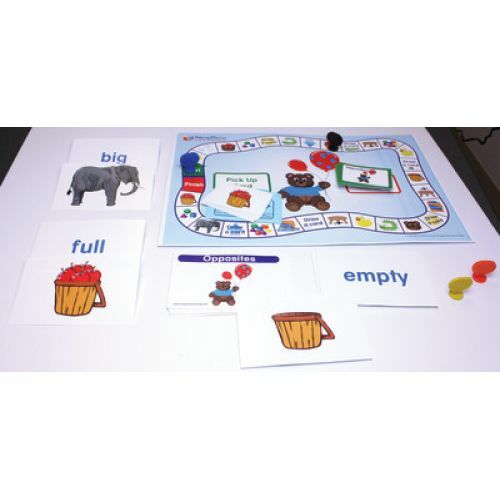 Learning Center includes engaging, hands-on game and correlated activities to match an image of position or opposite with its corresponding word. This complete, easy-to-use learning center is perfect for learning essential grade appropriate math skills. Designed for either teacher directed instruction or independent learning working in groups of 2-4 students, the learning center covers a grade appropriate curriculum-aligned math skills making it perfect for differentiated instruction. This ready-to-go learning center, allows students of varying abilities to work independently or cooperatively — students can use them in the classroom, after-school programs, or even at home for test preparation or practice and review! Enough materials are provided for up to 4 students and are a snap to set up and store in the pouch provided for years of use! Colorful, engaging and easy-to-use! Designed for either teacher-directed or independent play in groups of 2 – 4 students. Positions and Opposites Learning Center provides materials for 4 students and includes:. • 1 Teacher's Guide with step-by-step instructions, as well as recommended additional skill-building activities.. Packed in a zippered storage cloth bag.